So, what do you get when you combine cheese, jalapeños and bacon? Jalapeño Poppers, of course. Add Pillsbury crescent rolls to the mix, and you got yourself a crowd pleasing Halloween party appetizer. 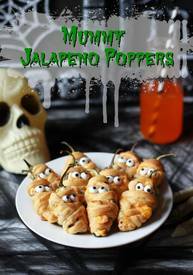 These finger licking good Mummy Jalapeños are flaky on the outside and gooey on the inside. Every bite packed with bold spicy flavor, creamy melted cheese, and BACON! How could you resist?